Julienne is a culinary knife cut in which food items are cut into long thin strips. When dealing with potatoes, it can be referred to as alumette. The word “alumette” is translated from French as “matchstick”, hence one more name, the matchstick cut. The measurement for julienne is approximately 1/8 inch x 1/8 inch x 1-2 inches. Julienning is probably the most popular method of preparing french fries, at least in fast food restaurants. The easiest way to julienne potatoes at home is to use a hand-held mandoline fitted with a fine julienne blade. 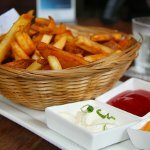 Shoestring fries can be made with both regular potatoes and sweet potatoes. To celebrate National Julienne Fries Day, cook some shoestring fries at home. They are cooked just like regular french fries. You can serve them with delicious truffle aioli to give the dish a new shade of taste. To make the aoili, whisk together 1/2 cup sour cream or crème fraiche, 1/2 cup mayonnaise, 1 tbs white truffle oil, zest of 1 lemon, 1 large clove garlic (grated), freshly ground pepper and kosher salt to taste.